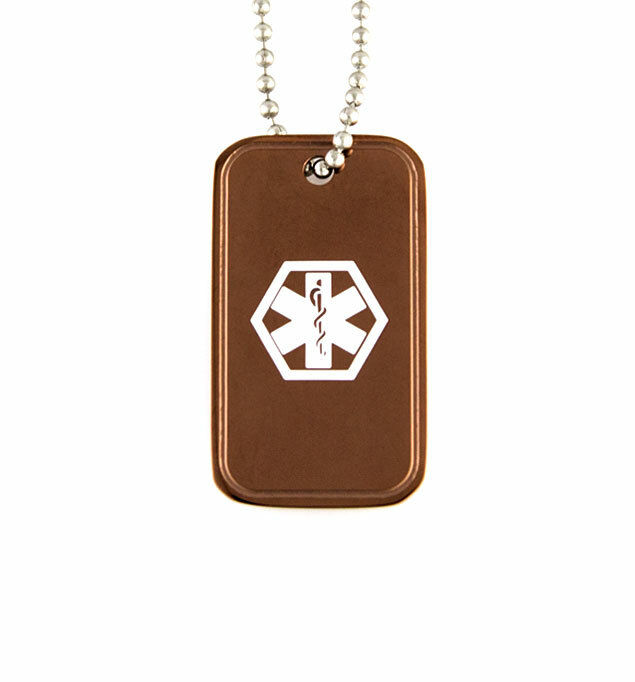 The Mark Stainless Steel Medical Alert Dog Tag is a custom-engravable, stainless steel medical ID pendant with a brown copper tone finish and a white medical caduceus symbol on the front, which serves to alert first responders to your medical information, which we will custom engrave on the back. An updated take on the classic stainless steel dog tag, Mark is water resistant and features comfortably rounded corners with a beveled ridge detail along the edge. This medical ID necklace measures 24” and is easy to cut down to size for children or use as a backpack loop. Whether you or your loved ones wear medical IDs for heart conditions such as arrhythmia, atrial fibrillation (A-Fib), deep vein thrombosis (DVT); food allergies such as peanut, tree nut, soy, or wheat allergies; adrenal disorders such as adrenal insufficiency or Addison’s disease; or for any other medical condition or treatment consideration, medical ID necklaces are an excellent option. Easy to wear and comfortable under or over a shirt, medical ID pendants and dog tags are a great choice for those with dexterity challenges as they can be slipped over the head without unclasping and reclasping.